It’s over. The carnage is finished. Some blood may have been shed, but we made it; we survived. Yes, Valentine’s Day came and went. Your sentiment to its 362 day hibernation probably banks on your personal Facebook status, or maybe the functionality of your love life. Depending on your relational footing, last week may have been on the receiving end of a stubborn battering ram armed with personal complaints, all strategically targeting last Friday’s holiday. Or perhaps you drowned last week in an overflow of pastel colored, heart shaped candies, tattooed with spontaneously cute love messages, all in anticipation of the big day, no… the big holiday; the big holiday that magnified your old or new love. However last week ended for you certainly leant on your own personal situation, but, as already established, last Friday was indeed Valentine’s Day. It came and passed, most likely with enough significance to shift the levels of your emotional soundboard. With that in mind, I thought it only fitting that our newest Mining Netflix column focus on a romance film which centers on the charm and brokenness of relationships. That film is Like Crazy. Like Crazy is a saga; a story that explores, with honesty, the excitement, trepidation, and dilemma of a wearing, romantic relationship between its two leads, Jacob and Anna, starting with the standard cuteness that lays the bricks for every couple’s humble beginnings. It kicks off in a classroom. Anna, a British journalism major in California on a student visa, is giving a presentation on the juxtaposition between internet sites like Myspace (the film takes in the early 2000’s-present) and the more traditional multimedia such as magazines and newspapers. Jacob, a furniture design major, who is serving as a teacher’s assistant in Anna’s class, is briefly distracted from his sketching by Anna’s intellectually inspiring presentation. Anna’s shifting eyes let the audience knows early on she is seriously crushing on her teacher’s doodling assistant. Her speech lays out some intriguing parallels between the evolution of multimedia and the stylistic, postmodern relationships incubated by the twenty-first century. As she says, “The internet, in contrast (to previous forms of multimedia), no longer requires there to be any notion of the group. Its concern is wholly with the individual… The act of the individual in defining their cyberspace borders is more important than what it is filled with; it is, simply, your space (referring to Myspace).” A fascinating comment that shines, prematurely, a light on the self-fulfillment seeking desires that will unfortunately come to fruition in her romance with Jacob. Staying true to her old-fashioned preferences, Anna kick-starts the relationship by leaving an old- fashioned letter on Jacob’s car, which leads to their first date. It was a first date that you might expect yourself to have, at least if it were a good one. From that day on, the two allow themselves to infiltrate each other’s lives, initiating themselves into the honeymoon period of the relationship. Jacob and Anna showcase the common candor of awkward silences and forced conversation-saving topics that are born purely out of the necessity to have conversation. There are certainly clichés that surface in their love, for example: a shared affinity for the same Paul Simon album naturally equates to being soul mates. But they are all clichés that I believe we would admit to having experienced ourselves at some point in time. Everything the pair does digs deep at the mystery of who their new companion truly is, or maybe who they want that person to eventually be. Against the backdrop of the happy couple’s expectations and inevitable projections, the movie’s insistent realism allows the good times to appear sublime, but adds considerable dismay to the bad. Conflict, of course, must enter the storyline, and the perceived perfection of Jacob and Anna’s togetherness draws toward a close with a lovely go-carting, beach-walking, candy shopping montage, accompanied by a simplistic, yet emotional piano track, which sets the tone for the building struggle about to erupt in their lives. Upon graduation, Anna’s student visa sequentially expires, which forces her to spend two and a half months away from Jacob, separated by land and ocean, in England before she can renew her visa in order to move back to the States. But the idea of separation is too painful for Anna to endure. Just talking about it makes her squirm like a toddler being dragged home from the playground. She decides to violate her visa. Anna spends the summer in America, with Jacob. When she finally does make the roundabout trip at the end of summer, she is denied access into America because of her visa violation. In her moment of impatience, fueled by inexhaustible passion, where she decided to spend the summer in America, Anna reshaped the course of her life with Jacob forever. Overturning a violated visa is a nearly impossible task. Even Jacob and Anna’s shotgun wedding won’t grant Anna American citizenship. Now as two separate parts of estranged whole, Jacob and Anna seek to fill up the sinkholes in their hearts while they are separated from each other. Neither Jacob nor Anna have any trouble finding someone who will love them, and they are reaching the age where the booming successes of their careers grow, but even with replacements and success, they still yearn for each other; they still yearn for something greater. Not until they two have all but given up hope of reuniting (spoiler alert), does Anna’s visa request get granted. Jacob and Anna both immediately drop their replacements, and Anna flies out to California to be with her husband. In the final scene the two decide to take a shower together, undoubtedly a symbolic attempt at relational renewal by the washing off of the old. Like Crazy’s last shot is a close up of Anna’s unsure face as Jacob holds her in the shower, paired with spliced shots compiled from scenes of the beginning of their relationship; pictures of who they used to be. The happiness of finally being together, forever, collides full on with the grim realization that they are left with themselves, the actual person of Anna and the actual person of Jacob. Though never spoken, a thought asking, “what if we are simply not enough for each other?” resonates loud and clear. As mentioned above, the wealth of the film lies in its honesty and realism. 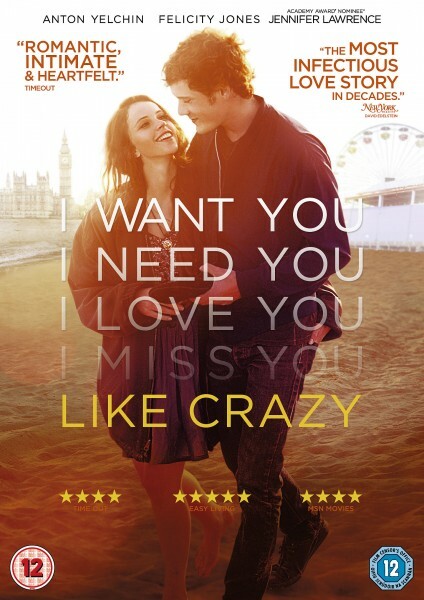 Like Crazy sees and exalts the charm of love and companionship, and it does so beautifully. But it chooses not to ignore the brokenness and cracks that any and every human relationship creates – even drawing us, the audience, in with Anna’s and Jacob’s perfect vision, and then qualifying that vision, and forcing us to question it, too. We’re tempted, irresistibly, to fill ourselves up with each other, and no one can fully meet those expectations. Jeremiah 2:13 says, “for my people have committed two evils: they have forsaken me, the fountain of living waters, and hewed out cisterns for themselves, broken cisterns that can hold no water.” The Creator of the universe knows us full well, so much so that He knows that when we seek complete fulfillment in each other, we not only confirm our separation from Him, but we also harm those we seek fulfillment in, applying a crushing pressure to their lives that they were not designed to tolerate. The shower scene fits surprisingly well with the cisterns verse, and washing off the past is also classic literary symbol derived from the Judeo-Christian tradition. But fortunately, within Christianity water has another symbolic valence – that of death – and it’s on the other side of the death of our expectations for total fulfillment that, perhaps, more genuine and well-ordered enjoyment of things can occur. Reasonably, the most common Christian-ism in today’s society is, “love God and love others,” but maybe it should be reworked to say, “Love God, so that you may love others.” This is of course a reference to Matthew 22:36-40, when a lawyer asks Jesus, “Which is the great commandment in the Law?” Jesus answers his question and then more in verses 37-40, “And he said to him, ‘You shall love the Lord your God with all your heart and with all your soul and with all your mind. This is the great and first commandment. And a second is like it: You shall love your neighbor as yourself. On these two commandments depend all the Law and the Prophets.’” We fail continually in the order of these commandments, to our detriment; God meets us there with total forgiveness borne of divine love. It is this love, on God’s initiative, which allows us to respond. We are first to love the Lord our God with all of our heart, soul, and mind because we could never love others the way that Jesus did – without him first loving us. Lovely reflection. Strong analysis and good thought of parallel with verse in Jeremiah. I loved this movie even though it was heartbreaking to watch. Glad Mbird has this piece.